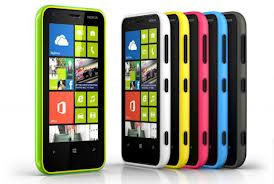 Nokia is pushing its Lumia smartphones as a strategy to compete with the likes of Apple with its iPhone series and Samsung's Galaxy Smartphones. - 1 GHz dual-core SnapDragon S4 processor, 5 MP autofocus camera and a range of vibrant colours to choose from. - Cinemagraph, the exclusive Lumia camera feature that adds motion to still images. Just snap a picture and pick the spots you want to animate. Then post the moving image on Facebook, Twitter or other social networks to get everyone laughing. - Smart Shoot; one click of the camera takes a series of snaps. Take the best bits from each photo to create the perfect group shot. - Nokia City Lens, just holding up your phone reveals everything around you. Watch shops, restaurants and businesses pop up. Discover places you never knew existed. Then tap the screen to see reviews, directions and links. - Dual-shot shells: Pick a colour. Pick two colours. See them work in layers, and with matte or gloss finishes. 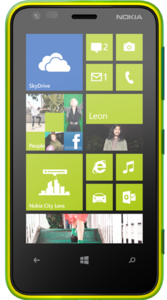 Personalise your Lumia 620. - Microsoft Office: Allows you to sync your phone to your computer with MS Office Applications on the move with Outlook, Word, Excel and PowerPoint. Sync is done via SkyDrive to keep important files at your fingertips. - Nokia Music: Stream Music from your favourite artists streamed to your phone for free. You can choose from hundreds of channels or create your own. And best of all, you can even listen when you're offline. You can read Adam Fraser's review of this phone here.